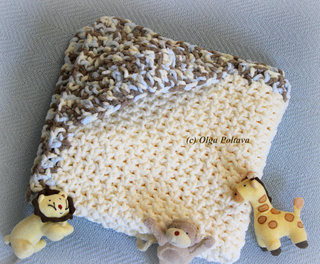 Until now I had only designed and crocheted baby beanies, but today I want to share something different. It’s a baby/toddler beret pattern that I came up with. Of the three berets shown in the picture, the lavender one was the first one I made. 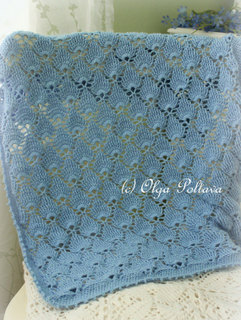 I used a light weight 3-ply acrylic yarn and size G/6 (4.25 mm) hook. The finished beret came out about 19 inches in circumference; it should fit a girl 12 - 36 months old. I needed to make a smaller beret, but I didn’t want to change/rewrite the pattern (it was enough work to come up with it in the first place), so instead I simply changed the hook size. For the pink and beige berets shown in the picture, I used size E/4 (3.5mm) hook and crocheted a bit tighter (personally I prefer working with smaller than recommended hooks anyway), and the berets turned out 16.5 inches in circumference. They should fit a girl under 12 months. 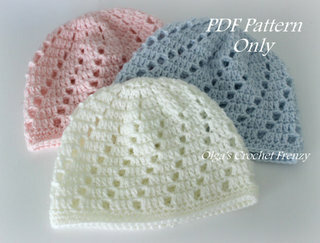 So the pattern is the same, but depending on the hook size you use, you can make a baby or a toddler size beret. Ch 7, join into ring with sl st. Round 1: ch 3, 15 dc in ring; sl st in 3rd ch of beginning ch-3. Round 2: ch 5, *dc in next dc, ch 2* around; sl st in 3rd ch of beginning ch-5. Round 3: ch 6, *2 dc in next dc, ch 3, dc in next dc, ch 3* seven times, 2 dc in next dc, ch 3; sl st in 3rd ch of beginning ch-6. Round 4: ch 6, *2 dc in next dc, dc in next dc, ch 3, dc in next dc, ch 3* seven times, 2 dc in next dc, dc in next dc, ch 3; sl st in 3rd ch of beginning ch-6. Round 5: ch 6, *2 dc in next dc, dc in next dc, 2 dc in next dc, ch 3, dc in next dc, ch 3* seven times, 2 dc in next dc, dc in next dc, 2 dc in next dc, ch 3; sl st in 3rd ch of beginning ch-6. Round 6: ch 6, *2 dc in next dc, dc in next 3 dc, 2 dc in next dc, ch 3, dc in next dc, ch 3* seven times, 2 dc in next dc, dc in next 3 dc, 2 dc in next dc, ch 3; sl st in 3rd ch of beginning ch-6. Round 7: ch 6, *2 dc in next dc, dc in next 5 dc, 2 dc in next dc, ch 3, dc in next dc, ch 3* seven times, 2 dc in next dc, dc in next 5 dc, 2 dc in next dc, ch 3; sl st in 3rd ch of beginning ch-6. Round 8: ch 6, *dc in next 9 dc, ch 3, dc in next dc, ch 3* seven times, dc in next 9 dc, ch 3; sl st in 3rd ch of beginning ch-6. Round 9: ch 6, *dc2tog over next 2 dc, dc in next 5 dc, dc2tog over next 2 dc, ch 3, dc in next dc, ch 3* seven times, dc2tog over next 2 dc, dc in next 5 dc, dc2tog over next 2 dc, ch 3; sl st in 3rd ch of beginning ch-6. Round 10: ch 6, *dc2tog over next dc2tog and dc, dc in next 3 dc, dc2tog over next dc and dc2tog, ch 3, dc in next dc, ch 3* seven times, dc2tog over next dc2tog and dc, dc in next 3 dc, dc2tog over next dc and dc2tog, ch 3; sl st in 3rd ch of beginning ch-6. Round 11: ch 6, *dc2tog over next dc2tog and dc, dc in next dc, dc2tog over next dc and dc2tog, ch 3, dc in next dc, ch 3* seven times, dc2tog over next dc2tog and dc, dc in next dc, dc2tog over next dc and dc2tog, ch 3; sl st in 3rd ch of beginning ch-6. Round 12: ch 6, *dc2tog over next dc2tog and dc, dc in next dc, ch 3, dc in next dc, ch 3* seven times, dc2tog over next dc2tog and dc, dc in next dc, ch 3; sl st in 3rd ch of beginning ch-6. Round 13: ch 2, *3 sc in next ch-3 space, sc in next dc2tog, sc in next dc, 3 sc in next ch-3 space* around; sl st to join round. Round 14 - 15: ch 2, sc in each sc around; sl st to join round. Finally fall has arrived! It seems that many trees around my neighborhood turned yellow, red, and brown just in a few days. The sites around are beautiful and I feel in the mood for the fall colors too. I had a bit of free time (my mom is visiting us right now and helps with the kids), so I experimented with the yellow, red, and brown yarn in my stash and came up with these simple flowers. I might add them to my autumn wreath that hangs on our front door now. Ch 5, sl st to join in ring. Round 1: ch 5, *dc in ring, ch 2* 7 times, sl st in 3rd ch of beginning ch-3. Fasten off, wave in the end. Round 2: Attach the second color in any ch-2 space and make (ch 1, dc, tr, dc, hdc) all in that same space, * (hdc, dc, tr, dc, hdc) all in next ch-2 space * around. Fasten off, wave in the end. 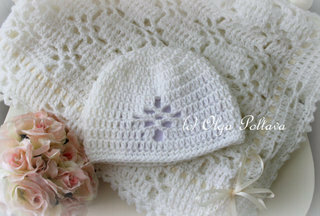 I have made lots of baby hats in the past year, but this one is rather special because of two reasons. 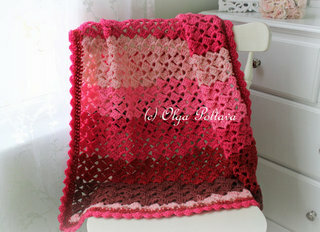 First, I made it for a very special little girl, who will celebrate her first birthday this month. Second, this hat is made of fine cashmere yarn and is fabulously soft and beautiful. I bought Jojoland 100% Cashmere Lace Weight Yarn (C-266, Lilac) from Paradise Fibers. One skein weights 50 grams and contains 440 yards of yarn. I used up about half of one skein for this baby hat. I hope there is enough yarn left to make another slightly bigger child’s hat as the very special girl has a very special sister, whose birthday is coming up in a couple of months too. 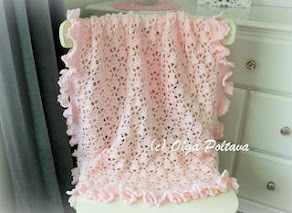 I gladly share my pattern below, but please do not repost it on other sites or worse yet sell it (yes, I have seen my free patterns being sold). Use this pattern to make hats for the special little girls you have in your life! The finished hat measures about 16 inches in circumference and 6.5 inches in height. It should fit a girl 12 - 18 months old. Round 1: ch 5, *dc in ring, ch 2* 7 times, sl st in 3rd ch of beginning ch-3. Round 2: sl st in next ch-2 space, (ch 1, dc, tr, dc, hdc) all in same ch-2 space, * (hdc, dc, tr, dc, hdc) all in next ch-2 space * around. Round 3: sl st to next tr; ch 5, (dc, ch 2, dc) all in same tr, * (dc, ch 2, dc, ch 2, dc) all in next tr * around; sl st in 3rd ch of beginning ch-5. Round 4: sl st in next ch-2 space, (ch 1, dc, tr, dc, hdc) all in same ch-2 space, * (hdc, dc, tr, dc, hdc) all in next ch-2 space* around. Round 5: sl st to next tr, ch 5, dc in same tr, * (dc, ch 2, dc) all in next tr * around; sl st in 3rd ch of beginning ch-5. Round 6: sl st in next ch-2 space, (ch 1, dc, tr, dc, hdc) all in same ch-2 space, * (hdc, dc, tr, dc, hdc) all in next ch-2 space* around. Rounds 7-10: repeat Rounds 3-6. Rounds 11- 25: repeat Rounds 5-6 (ending with round 5). Round 26: ch 1, 3 sc in each ch-2 space around; join round with sl st.
Rounds 27: sc in each sc around; join round with sl st.
Rounds 28-29: repeat Round 27. Use two strands of yarn to make the flower. Row 1: dc in 3rd ch from hook and in each ch across. Turn. Row 2: *sc in next dc, 5 dc in next dc* across; sc in last dc. Finish off but leave a yarn tail long enough to sew the flower together and attach it to the hat. Wave in the short yarn tail on the other end of the work. Use a tapestry needle to finish the flower. 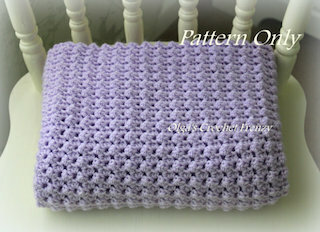 Little by little, roll the crochet piece and stitch together. 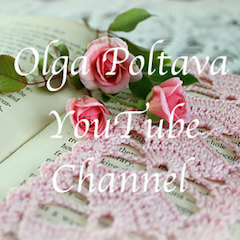 For more help making this flower, see my photo tutorial. Sew the flower on the hat. This week I’m working on decorating my home for the autumn holidays. I already took out the indoor decorations and put them on display in our dining and family rooms. I still need to decorate the front door area and carve jack-o-lanterns. I know my boys will be glued to the window when the jack-o-lanterns are glowing in the dark in our front yard. That’s so much fun to them! And what is fun for me this time of year is cooking and baking in my cozy kitchen, which needs a bit of decorating and cheering up too. 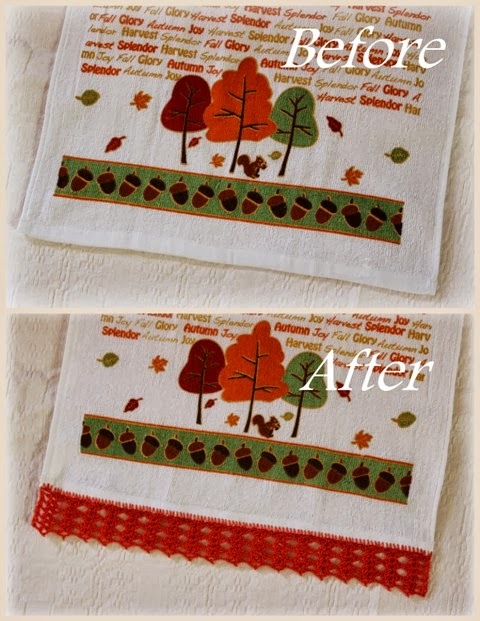 I bought a set of two cute, autumn themed kitchen towels, which should bright up my kitchen. 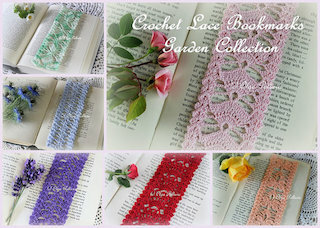 But for extra charm I’m adding crochet lace trims. It is an easy and fun project to do. I already finished one towel and I’m working on the second one. 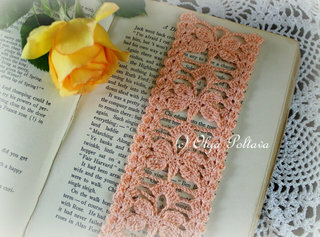 Steel hook size 10, size 10 crochet cotton thread. Shell: (2 dc, ch 2, 2 dc) all in one space. Row 1: sc across working directly into fabric. Row 2: ch 1, sc in next sc, *ch 1, skip 2 sc, shell in next sc, ch 1, skip 2 sc, sc in next sc* across. Turn. Row 3: ch 3, dc in same beginning space, ch 1, *shell in next shell, ch 2* across; shell in last shell, ch 1, 2 dc in last sc. Turn. Row 4: ch 3, dc in same beginning space, ch 1, *shell in next shell, ch 1, sc in next ch-2 space, ch 1* across; shell in last shell, ch 1, 2 dc in last dc. Turn. Row 5: ch 3, dc in same beginning space, ch 1, *shell in next shell, ch 2* across; shell in last shell, ch 1, 2 dc in last dc. Turn. Row 6 same as Row 4. Row 7: ch 3, dc in same beginning space, *ch 1, (2 dc, ch 1, picot, ch 2, 2 dc) all in next shell* across; ch 1, 2 dc in last dc. Fasten off. 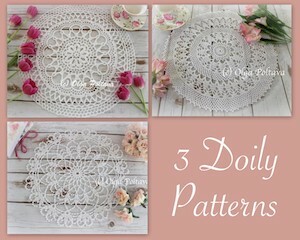 Do I really need another doily? I already have a whole bunch of them. I already gifted away another bunch. And I even tried selling them, but no one wants to buy. And yet I just can’t stop this obsession of making new ones. I’ll tell you my secret. 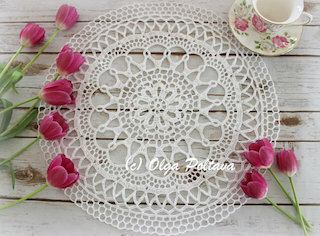 Sometimes I crochet a doily just for the sake of crocheting, taking photos and sharing them on my blog. Then I unravel it and use the thread to make another one. until I took these pictures! My goodness, it’s so romantic, so delicate, and so dreamy. I can’t bring myself to unraveling this beauty. 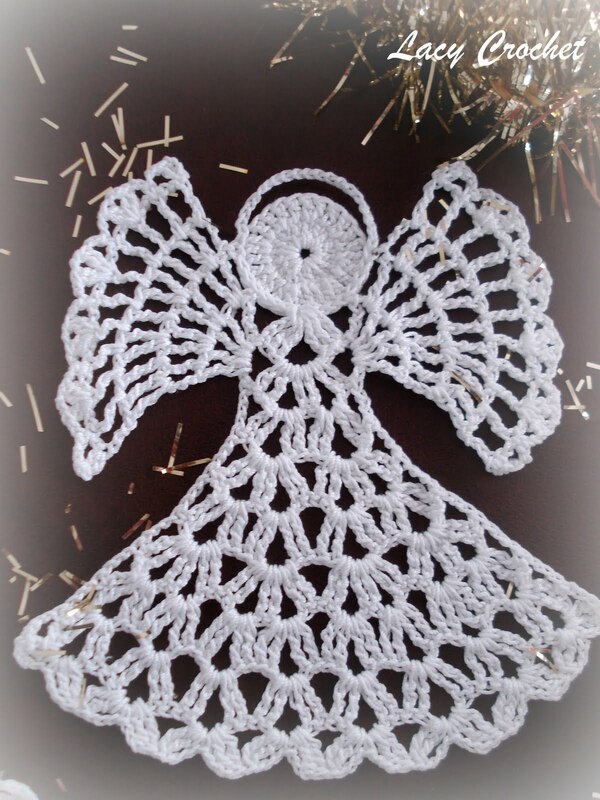 So it too will go into my drawer of doilies. And it probably will be a long time before it sees the daylight again. 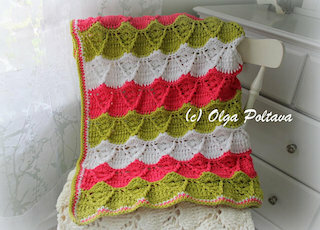 I used a steel crochet hook size 4 and crochet cotton thread size 10. 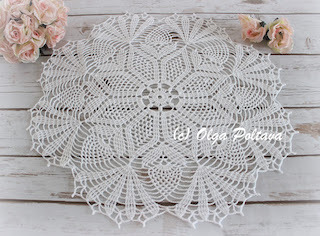 The doily came out about 29 inches across from tip to tip. This was a vintage pattern from Complete Book of Crochet, The Spool Cotton Company, 1946. 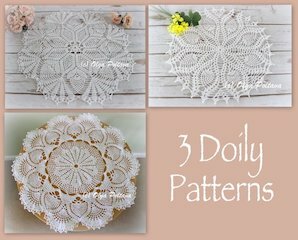 This is Pineapple Doily number 7275-M. I believe this pattern is in the public domain now, so I post it below (please, let me know if I’m wrong, and I will remove the pattern right away). Starting at center, Ch 16, join with SLst. First Rnd: Ch 3, 32 Dc in ring, SLst in 3rd st of Ch-3. 2nd Rnd: Ch 3, Dc in each Dc around; join to 3rd st of Ch-3. 3rd Rnd; Ch 3, Dc in same place as SLst, 2 Dc in each Dc around, SLst in 3rd st of Ch-3. 4th Rnd: Rep. 2nd Rnd. * Ch 3, skip 2 Dc, 2 Dc in next Dc. rep. from * around, end with- Ch 3, join to 3rd st of Ch-3 (22 Dc-groups). 6th Rnd: SLst in next Dc and in next sp, Ch 3; in same sp make Dc, Ch 2 and 2 Dc; in each Ch-3 sp around make 2 Dc, Ch 2 and 2 Dc; join. * Ch 1, in next Ch-2 sp make 2 Dc, Ch 2 and 2 Dc (shell over shell). rep. from * around, end with- Ch-1; join. 8th to 12th Rnds incl: Rep. 7th Rnd, having an extra Ch between each shell in each Rnd. 13th Rnd: SLst in next Dc and in next sp, Ch 3; in same sp make Dc, Ch 5 and 2 Dc. * Ch 6, in next Ch-2 sp make 2 Dc, Ch 2 and 2 Dc, Ch 6; in next Ch-2 sp make 2 Dc, Ch 5 and 2 Dc. rep. from * around; join. * Ch 5, in next Ch-2 make 2 Dc, Ch 2 and 2 Dc; Ch 5, 13 Tr in Ch-5 of next shell. rep. from * around, end with- Ch 5, join. * Ch 3, shell over next shell, Ch 3, Tr in next tr; (Ch 1, Tr in next Tr) 12 times. rep. from * around; join to 4th st of Ch-5 first made. Ch 3, shell over next shell, Ch 3, Sc in next Ch-1 sp. rep. from * around, end with- Ch 3, Sc in first Ch-3 lp. * Ch 3, shell over next shell; (Ch 3, Sc in next lp) 11 times. rep. from * around, end as in l6th Rnd. * Ch 3, in Ch-2 of next shell make 2 Dc, Ch 2, 2 Dc, Ch 2 and 2 Dc. (Ch 3, Sc in next lp) 10 times. rep. from * around, end as before. * Ch 3, in next Ch-2 make (1) shell, Ch 2, shell in next Ch-2. (Ch 3, Sc in next lp) 9 times. * Ch 3, shell over next shell, Ch 1, shell in next Ch-2 sp, Ch 1, shell over next shell; (Ch 3, Sc in next lp) 8 times. (Ch 3, Sc in next lp) 7 times. (Ch 3, Sc in next lp) 6 times. * Ch 3, shell over next shell, Ch 5; in next shell make 2 Dc, Ch 5 and 2 Dc; Ch 5, shell over next shell; (Ch 3, Sc in next lp) 5 times. * Ch 3, shell over next shell, Ch 3, 14 Tr in next shell, Ch 3, shell over next shell; (Ch 3, Sc in next lp) 4 times. Ch 3, shell over next shell; (Ch 3, Sc in next lp) 3 times. Ch 3, shell over next shell; (Ch 3, Sc in next lp) twice. Ch 3, shell over next shell; Ch 4, Sc in next lp. rep. from * around, end with- Ch 4, SLst in first Sc. Break yarn. (Ch 3, shell over next shell) twice. rep. from * around. Join. Ch 3, shell over next shell, Ch 1, shell in next Ch-3 sp, Ch 1, shell over next shell. (Ch 3, shell over next shell) 3 times. Ch 3, shell over shell, (Ch 4, shell over next shell) twice. Ch 3, shell over shell, Ch 5, in next shell make 2 Dc, Ch 6 and 2 Dc; Ch 5, shell over shell. Ch 3, shell over shell, Ch 3, 16 Tr in Ch-6 lp, Ch 3, shell over shell. rep. from * around (3rd Rnd of pineapples started). Cont. to work around until only 1 lp remains at top of 2nd Rnd of pineapples. Ch 4, shell over shell. To Make Points: first Rnd: Ch 3, turn. Ch 4, shell over shell. Ch 3, turn. Cont. in this way, having (1) Ch-3 lp less on each Rnd until 1 lp remains at top of pineapple. Ch 3, turn. Ch 1, SLst back in Ch-2 of last shell, Ch 1, 2 Dc where last 2 Dc were made. Attach yarn to first shell of next pineapple and complete the point in same way. Cont. thus until all 11 points have been worked. The weather is still summerlike during the day, but the nights and evenings are chilly. The days are shorter, and during the dinnertime time it’s already dark outside. It’s nice to light up candles and turn on some relaxing classical music during dinner. 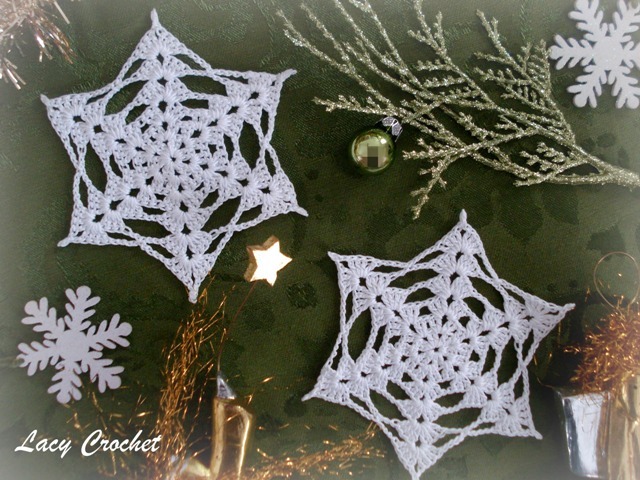 I used my black Mantilla doily that I crocheted last year to create a simple dinner table centerpiece. With Halloween coming in less than a month, the black color is quite suitable. The candles are flameless (good idea when kids are around). But they are made of real bee wax and look almost real; they also have a subtle vanilla scent. This is the only black doily I have. Black thread is not easy to work with, and I don’t think I’ll be making another one. 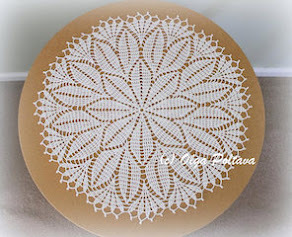 The free pattern for this doily was from Coats and Clark website. You can see it here.